With the modern simplistic attraction, this center has many happy tenants. You can enjoy the many amenities and nearby attractions. 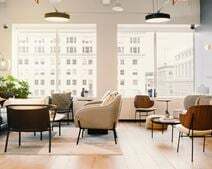 Some of the amenities included are the access to all centers worldwide, meeting rooms, conference rooms, copy and print facilities, Wifi, Hot Desks, flexible terms, furnished office space, and more. This center is located in the creative district and called The Pearl. It is just off Stadium Freeway. You can enjoy nearby eateries such as, Teadrop Lounge, Oven and Stacker, Von Ebert Brewing, Splash Ultra Lounge, 10 Barrell Brewing, and much more. Try Living Room Theaters after a long day at work or outing with the team or stop by North Pr Blocks for shopping and fun. This downtown Portland business centre boasts views of the Willamette River and Mt Hood. Offering a stylish and professional work environment, this centre also includes two meeting rooms and a reception area. With free public transport in the downtown area you will have access to all of the cities restaurants, shopping, hotels and entertainment. 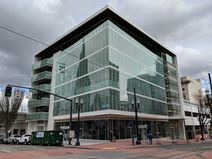 With panoramic views of downtown Portland, the Willametter River and the Lloyd District, this 16th floor center provides plenty of light and space and access to a landscaped plaza where you will find coffee shops and a credit union. This center has a plethora of amenities and is one of the most unique and modern buildings in the city. With a combination of private offices and co working, you have many options. Some of the amenities include: conference facilities, meeting rooms, Wifi,Non-branded offices, on-site management and more. This center will not disappoint. Grab your team and tour today! Located in one of the main bicycling areas of Portland, this center is is a perfect mixture of work/life balance atmosphere. Take a stroll or bike adventure before or after work. Grab some coffee before you start your day or a beer after you end it at COSUBE. There are plenty of eateries nearby to grab lunch, a snack or a peaceful dinner to end a long work day. Take the team out and explore the town! In one of the city"s most historic buildings which was once home to the U.S. Custom House you will now find three floors of collaborative coworking space which perfectly blends the modern with the traditional. Home to non-profit groups, freelancers, designers and a range of other businesses. This dog friendly space even has a games lounge to make you fee right at home. The great local transport links also make the center easily accessible from far afield. In addition to the fully furnished and prestigious executive suites and co-working areas available for prospective business professionals this building in Portland's foremost trendy and upscale Pearl District, the center also provides traditional workspace solution packages and is ideal for start-ups in the technologically innovative and creative industries that constitute the area's thriving commercial community. With the option to rent whole rooms as private, serviced space or individual desk space in a collaborative shared environment this center is located in the heart of the Pearl District and provides great access to public transport links and amenities. Located in a landmark 43-story tower known for its striking architecture, this centre provides stunning views of the local surroundings and is the largest class A building in the entire city. This center provides an on-site Community Manager to help greet your guests and make members feel welcomed Monday through Friday, meeting rooms available to rent by the hour, private fiber internet connection, break rooms, mail service, onsite bike parking and private shower rooms, etc. Its beautiful modern appeal will leave you ready to lease! This location is is at the convergence of Portland’s creative core and central business hub. Wrapped in glass & greenery, it stands in a muscular urban location. They’ll know your name by heart at Blue Star Donuts, Tasty & Alder and Multnomah Whiskey Library - all within a stone’s throw of the from the front door. The airport is within ten miles and train stations are less than seven. Be on top of the world in this modern downtown Portland facility. 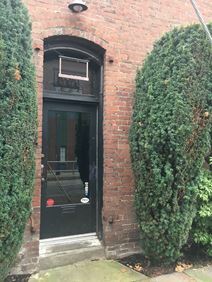 This property sits conveniently close to the Max Train Line and puts minutes’ between you and the Convention Centre and Rose Garden Arena. The centre offers a variety of on-site services, including a lounge and Internet café. This business centre offers Willamette River views from your office window, close proximity to downtown Portland and all the professional amenities you'll need for your business to thrive, including furnished office space, support services and free onsite parking. You can take advantage of bike storage with showers and lockers, conference spaces, and Water Ave’s on-site coffee bar. Along with professional conference rooms, a huge common area, wellness room and phone booths. This warm and very inviting workspace is perfect for your team to brainstorm and thrive. Come by and check out one of the most unique and inviting centers in the area. You will be amazed by its outdoor space to relax and showers after a nice workout. Bring along your furry friend, because this center is pet-friendly! You will love the amenities such as the Fruit Water and Coffee bar along with the social events that happen making it a real community. The commute is ideal for most, having plenty of nearby bus lines and you can head over to Pioneer Square Mall to shop or grab a bite at one of the local eateries. 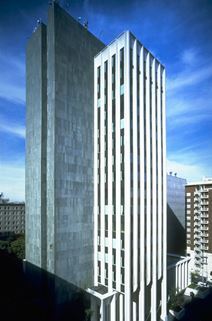 Turn-key offices are supplied by this center housed within this downtown Portland office space. The 11th floor provides great views across the city while youll have access to conference space and a shared receptionist.